The Seattle Mariners anemic offense should have been an ideal matchup for Phil Hughes, but the Yankees’ young righty suffered with his command in the zone all game. Before exiting with two outs in the sixth, Hughes had surrendered seven runs on 10 hits to a Mariners’ lineup that was averaging only 3.4 runs per game. What uniform will Cliff Lee be wearing this time next month? Unfortunately for the Yankees, Mariners was still emblazoned across his chest during last night's complete game victory. After throwing a scoreless first inning and being staked to an early 1-0 lead thanks to a Nick Swisher home run, Hughes allowed the lead off runner to reach and score in each of the next four innings. By the sixth inning, it was clear that Hughes had reached the end of his rope, but for some reason Joe Girardi allowed his pitcher to hang himself. Even after Jack Wilson’s RBI single extended the Mariners’ lead to 5-1, Girardi left Hughes in to surrender a two-run double to Rob Johnson. Girardi’s inability to see that Hughes was not going to regain his lost command left the Yankees in an insurmountable 7-1 hole. 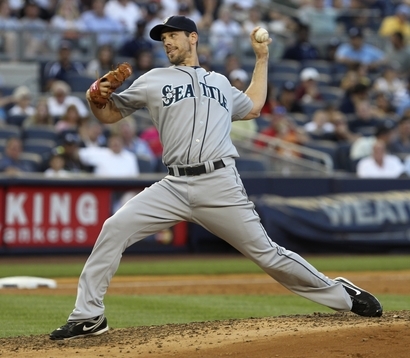 Once staked to a large lead, Cliff Lee went about carving up the Yankees lineup. With the exception of Nick Swisher, who hit his second solo homerun of the game in the sixth inning, Lee surrendered only one single to Curtis Granderson from the fourth through the eighth innings, putting him in line for his third straight complete game. In the ninth, the Yankees did make Lee work hard to go the distance, rallying for two runs and coming within one baserunner of bringing the tying run to the plate. Had Girardi been more proactive in removing Hughes from the game, the ninth inning rally might have had more teeth, but the deficit was too large to overcome. There’s no shame in losing to a top pitcher like Cliff Lee, but giving up seven runs to one of the game’s worst lineups is somewhat disconcerting. Unlike other outings when he hasn’t had his best stuff, Hughes’ struggles seemed to result from an inability to command his fastball within the strike zone. Hughes has been able spot both his two seam and four seam fastballs all season, so it’s only natural to suggest that the long layoff was the reason that so many kept leaking back across the middle of the plate. Although protecting Hughes should be a priority, the Yankees have to also make sure they do not disrupt his routine to the point that it renders him ineffective. Hopefully, yesterday’s blip represents just a brief re-acclimation period for Hughes because the Yankees need their young ace to help compensate for the struggles of AJ Burnett. Considering the latter, perhaps it wasn’t the best time to skip Hughes, but that’s water under the bridge now. Going forward, however, the Yankees have to make sure the “Hughes Rules” do not compromise the team’s pennant hopes. With Joe West umpiring a Yankees game for the first time since making disparaging comments about the their pace of the play, both teams were on their best behavior for the Cowboy. The game was played in a brisk 2 1/2 hours. Before the game, Tennis player John Isner threw out the first pitch. Last week at Wimbledon, Isner took part in the longest match ever played at a WTA grandslam event. Cliff Lee’s third straight complete game increased his league leading total to four. Lee is the first pitcher to complete three straight games since C.C. Sabathia accomplished the feat in July 2008. The stretch is also the longest since Roy Halladay completed four straight games in April 2008. Including the World Series, Lee is now 5-1 in his last six starts against the Yankees. Nick Swisher belted two homeruns in one game for the 15th time in his career.